The Greenwich Fire Department responded to a fire at 15 Locust Road around midnight on Friday, Aug. 10, 2018. GREENWICH — Neighbors are repeating their pleas for a northwest fire station after a home in the Greenwich neighborhood was destroyed early Friday in a fast-moving blaze. 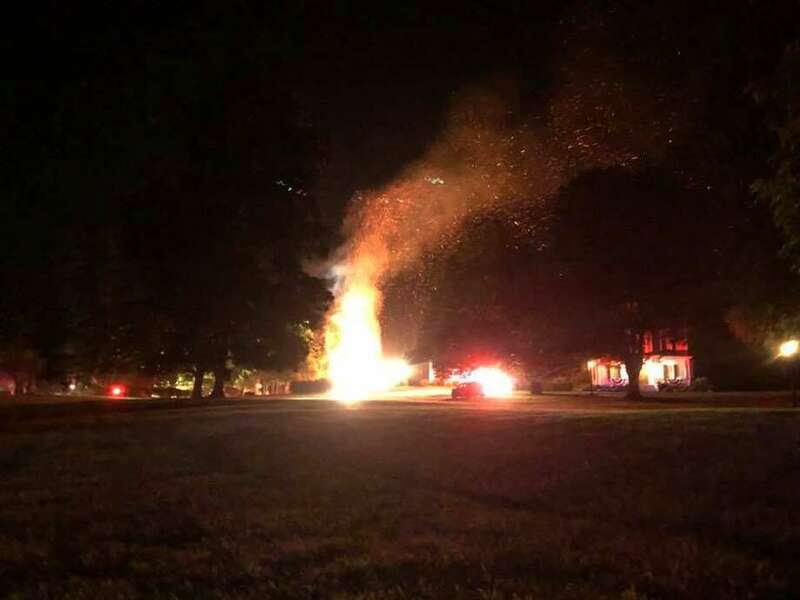 The Greenwich Fire Department said the residence at 15 Locust Road was already engulfed in flames when the first firetruck arrived around midnight. “It was a total loss,” said Deputy Fire Chief Keith Millette. The first truck on the scene, from the Glenville Fire Station, arrived in nine minutes, said Millette. “Response time would have been quicker if there was a northwest station, but it cannot be said with any certainty that it would’ve changed the outcome,” said First Selectman Peter Tesei, a supporter of building a new fire station in that corner of the community. Millette said of the response time, “We try to keep it under five minutes. This was above average.” The neighborhood near the New York state line is geographically the most distant from a fire station — “it’s the farthest point in Greenwich,” he said. There was little that firefighters could do, Millette said. “The house was literally, fully engulfed in flames on arrival,” he said. A neighbor called in the fire at 11:52 a.m. The fire crew from Glenville began hosing the structure with water as soon as it arrived, while additional apparatuses were brought in. With no hydrants nearby, firefighters called in two water tank trucks to fight the fire. Firefighters also drafted water from a pond at the Tamarack Country Club about 2,500 feet away. No residents were home at the time of the fire, according to fire officials. Two owners inspecting the damage Friday declined to comment. Neighbors said the owners were living on a larger house on the property, separate from the one that was destroyed. A relative had moved out of the house hit by fire earlier in the year, they said. The department is still investigating the cause of the fire, and there was no initial explanation for the cause. Some 50 to 60 firefighters, including a large contingent of volunteers, responded to the blaze. No injuries were reported. The Armonk Fire Department, across the border in Westchester County, N.Y., also assisted. The issue of response time for firefighters in northwestern Greenwich has been contentious. Allen Williams, head of the Northwestern Greenwich Association, said he was hoping that town leaders and the Representative Town Meeting would give the issue another look. An earlier measure to build a northwest fire station did not advance. Some action on the issue may take place this year. A petition is being circulated to support a fire station in northwest Greenwich. Gerald Anderson, chair of the RTM’s District 10, which covers that part of town, said there would be a “sense of the meeting resolution” introduced to the RTM for its September meeting, to push for reconsideration of the station. Williams added that the association’s members and board were weary of continually lobbying the town to make fire safety in northwest Greenwich the same as everywhere else in town. Staff Reporter Pat Tomlinson contributed to this story.